If, say, a humble inventor by the name of Kev devised a means to travel in time, and if, say, for inexplicable reasons, you chose to travel back three decades and saunter along St Matthew's Street, you'd encounter Howes of Ipswich, "motor car agents and dealers". Inside their snazzy glass-fronted showroom, you might glimpse the latest Sunbeam Rapier or Hillman Avenger or Chrysler Alpine. Heady days. Don't look for it now, kids: it's long since dulled into Blockbuster, home of The Fast & The Furious. Similarly (Simca-larly? ), that awkwardly shaped corner unit between Blockbuster and the funeral place has had many guises, from Bendix launderette to ladies' outfitters to pine place to Polish deli. 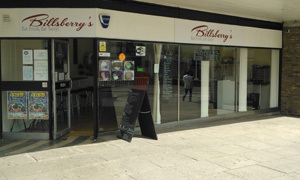 Since the turn of 2012, and not quite catching the eye of Star Express over the road, it's been Billsberry's -- Eat Fresh, Eat Tasty! Friendly fella running the place thinks there's a shortage of takeaway lunch places up this end of town, and so offers a huge range of savoury goodies on his huge blackboard. Tough to decide: used to be even more choice, he says. My eye alights on the burrito -- must check if the Buttermarket's El Taco Loco is still going -- while Andy plumps for the panini. We had some seating outside, says the owner, but the council wanted T pounds per table and C pounds per chair, algebraically speaking. Couldn't afford that, so we're inside away from those harmful rays of the sun. Burrito is freshly made, spicily good, and wrapped in foil on a paper plate. Not too many home comforts for those eating in. That Andy's a sucker for a shake and goes for something with Snickers. Generous portion, blended on the spot and works for him. While he's slurping away, I move on to a cellophane-wrapped brownie. Prepared to be underwhelmed, I'm v. pleasantly surprised: it's a fine thing. Coffee's half-decent too. Better than expected all round, and with free WiFi. If it was a car -- Matra-Simca Bagheera. If they were passing by -- Pillsbury Doughboy.